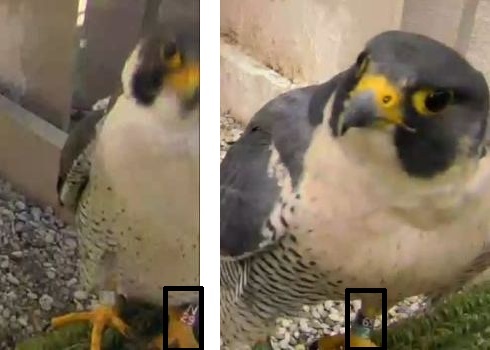 Now that we’ve had a complete changeover of adult peregrines at the Cathedral of Learning (as of 6 April 2016) we need new guidelines for telling apart the male and female. Here are some clues for identifying Terzo and Hope when viewing them on the nestcam. The most reliable clues are listed first. 1. Faces: Examine the photos above for these clues. Terzo is at top, Hope on bottom. Terzo: The area between Terzo’s malar stripe (moustache) and the dark gray of his nape (back of his neck) is bright white with a small black spot at the top. His “necklace” is long and thin and almost reaches the bottom of his malar stripe. Some people say the white area framed by gray looks like a heart. 2. Band colors: Terzo’s color band is Black over Red, N/29. Hope’s is Black over Green, 69/Z. 3. Plumage contrast on back: Adult male peregrines usually have paler gray backs than the females. See the photos below: Terzo above, Hope at bottom. Terzo: His head and wingtips are darker than the feathers on his back. 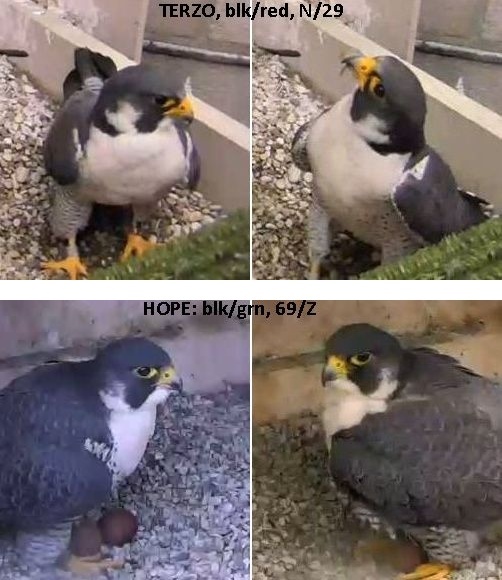 Hope: Her feathers are more uniform in color. Terzo is a bright white bird and this shows on his legs and flanks. His striped feathers are more white than black. Hope’s dark stripes are much more obvious. And now, a quiz. Can you figure out who is who in this photo? Who’s at the back? Who’s in front? What clues did you use? Has there been any report from the death of E2 regarding the cause of his death? Bethany, no. I do not expect to hear anything about it for several months, maybe not until June. Good morning, and thanks for sharing the differences for us! Terzo is in the back – dark wing tips, lots of white are the clues I could see, plus I think I can see red on his leg band. Hope is in front, with more grey on her back and nice stripes on her flanks. I think Terzo is the bird in the rear of the nest box based on the appearance of the necklace area, as well as darker tail feathers. 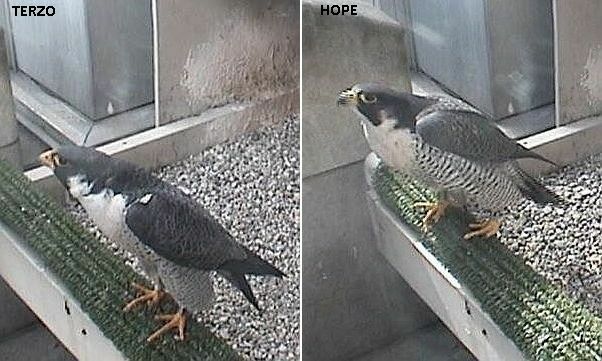 Hope, then, is the front-most bird with more white at the neck, more uniform back and wing coloration and more distinct dark stripes. Terzo is in the back and Hope is on the perch. So the one pic shows the male sitting on the eggs. That is a good sign. One additional thing I have noticed. When Terzo is minding the eggs, he seems to be quite restless like he can’t wait for Hope to get back and take over! The details you list along with photos are so very helpful. Thanks Kate for taking time to do this. I was able to say Terzo is definitely bird in back. Terzo’s very black with bright white contrast in necklace area. Hope in front, with leg flanks showing darker stripes, even in bright sunlight. Terzo in back – the red on the band is noticeable. I’m happy to read the other details, since it’s not possible to see the bands when they are incubating. To me, Hope also looks like she has a heart between nape and moustache, but the info about Terzo’s necklace and dark head and Hope’s muddy grayish heart will be helpful. Great detail to teach those of us without falcon eyes to learn to see the details! 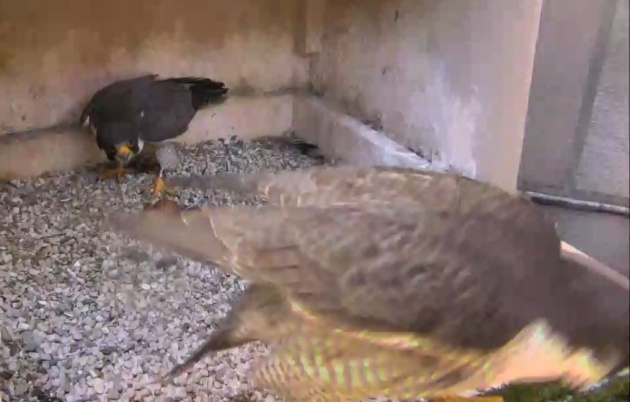 Is it your opinion that incubation is currently taking place on the falcon eggs? I think when there is a close up, Terzo has a much more innocent look. He has a very soft gaze. Before it was verified who he was and his age, I was pretty sure he had to be a young peregrine. Terzo in back, I believe I can see a red band on his leg and darker tail feathers. Terzo is much more black & white! 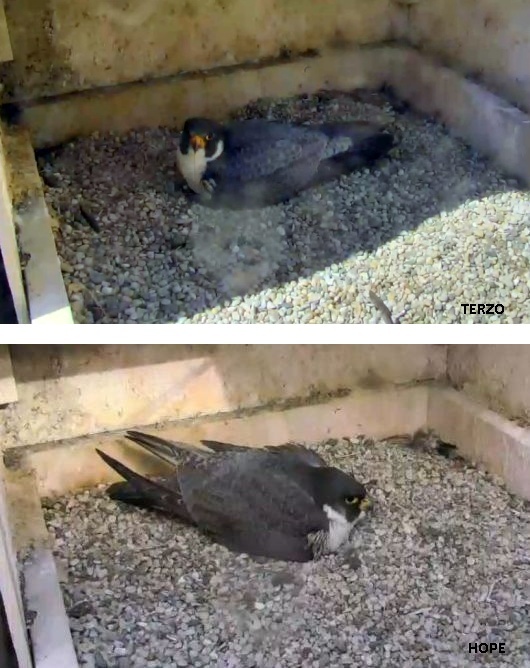 It looks like there was a new peregrine in the nest box this afternoon with Terzo around 3:14pm on 04/08. Very brown-ish in color and definitely not Hope. Zack & sheba50, oops! There was a juvenile petegrine at the nest but no fight on camera. Hope is incubating now. We shall see.